Rancho Bernardo consists of canyons and rolling hills in Northern county of San Diego. It’s sprawling community packed with shopping malls, golf courses, and office parks offers entertainment to visitors. The oldest operating winery in Southern California, the Bernardo Winery has been around since 1889. Every year during the summer, Rancho Bernardo hosts a carnival-type street fair, RB Alive! Rancho Bernardo is home for the Corporate Headquarters of Sony US. 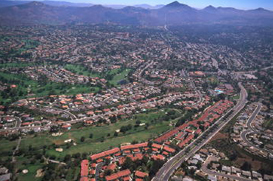 Companies like Sony and Hewlett-Packard employee over 50,000 people in Rancho Bernardo. The quiet town is an innocuous example of what San Diego can offer a family that likes to relax amongst a scenic country area, and still be a quick commute away from the numerous attractions in San Diego.